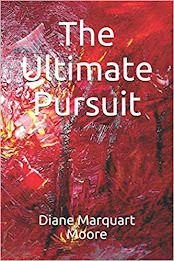 When Karen Bourque agreed to work on a glass piece that would become the cover of my latest book of poetry, I knew that the art would be both original and arresting. And that phrase aptly describes the stunning glass piece that was photographed for the cover of A Strand of Beads, a collection of poems about rosaries and other strands of beads people use when praying. 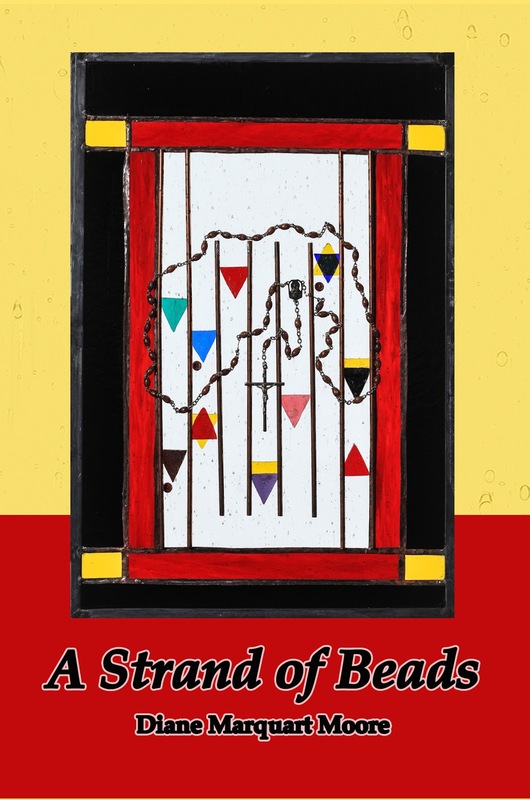 Karen's description of the piece she calls "Dachau: Badges and Beads" made a perfect preface for the lead poem in this collection of poetry. The last paragraph of her preface is deserving of great notice. She wrote that "the horrors that took place at Dachau and the sorrows those horrors generated are inconceivable to me. In creating this piece, my intent was to respectfully turn the identification badges into a thing of beauty, to undermine the meanness of the original intent by having the badges themselves, as they exist in our memory, become symbols of all those souls' inner light. Whether the badges were worn on their sleeves, their pants' legs or wherever, the badges in this reconstruction symbolize hope for release into a better world, hope for some force that might open the gates of horror and hate, hope for the deliverance that was not there for the millions who perished in one madman's failed experiment." Border Press presents my 22nd book of poetry and includes a blurb on the back cover that captures the spirit of this collection: "Whether beads are used to mark repeated prayers, incantations, or devotions, over two-thirds of the world's population use them in religious practices. In A Strand of Beads, the majority of the poems focus on prayers addressed to Mary—rosaries said in praise and entreaty and for metaphysical/psychological reasons. Other beads, such as the Persian strand the poet received in Iran, focus on protection from negative energy and provide relief from stress. The lead poem features a rosary obtained from Dachau and tells the story about the marriage ceremony of two people who choose to spend their honeymoon in southern Germany and Poland. When the couple brings the Dachau strand back as a gift for the poet, she experiences revelations while using it and wishes the couple had kept the rosary and used it to preserve their marriage. Whether writing about glass beads, precious stones, or wooden beads, Moore is always cognizant of the word 'bede,' the old English word that means 'prayer,' and of the cogent spiritual energy within each strand of beads." 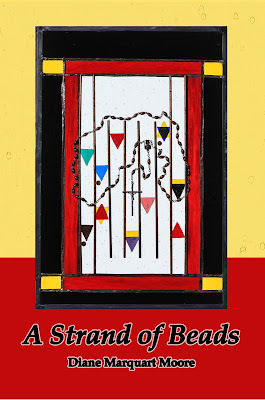 A Strand of Beads will be released in a few weeks and will be available on amazon.com, or may be ordered by mail from Border Press, P.O. Box 3124, Sewanee, TN 37375. 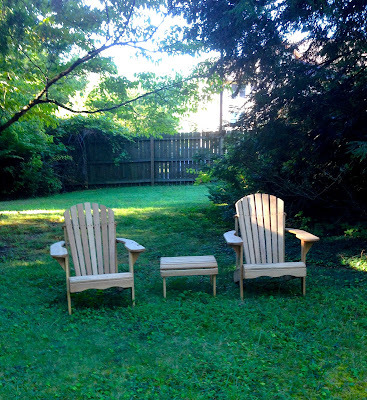 There they were—two unfinished Adirondack chairs poised beneath the shade of the tall hemlock in the backyard, looking as though they belonged on Lake Champlain in Westport, New York where their creator conceived the idea for this piece of outdoor furniture. All summer I have passed interpretations of this classic chair when I walked on the campus here at Sewanee, Tennessee and longed for at least one of these low-seated, wide-armed chairs. A few weeks ago, I received a late birthday gift of two of these chairs and a small table that complemented the Adirondack design. Humidity reigned, then rain fell, and the Adirondack chairs sat poised under the cedar, looking comfortable and durable, but weather didn't allow me to use them. A few days ago, "in the cool of the evening," as we say in the South, my good friend Vickie told me it was time to try out the chairs. "You have to take off your sandals and let your feet rest on the ground," she said, after we plunked down in the chairs that are sometimes called the chairs of 'American Summer.' "There's evidence that 'earthing' will dispel the negative charges and toxicity in your body into the ground, and you'll feel healthier from the experience," she added. I seldom argue with a scientist, particularly one who exudes good health and stays abreast of latest nutrition and health practices. "I just came out here to relax, maybe even rest a glass of some libation on this wide arm," I told her. "However, I notice that there are splinters—and what is this black stuff—mold?" "We've had a lot of rain. I reckon they should be painted. Or sealed or something. But you're always seeing things need to be done when you get out in the yard. Just keep your feet on the ground and let the negative charges trickle out." "I think there's a colony of ants trickling in and climbing my leg." "You just don't know how to enjoy the ultimate armchair," she said, sighing heavily. "Just go in the house and get the can of OFF, and then we can resume this exercise." There, she had done it—she had called the activity of relaxing in the Adirondack armchair 'exercise,' a word that quickly builds up negative charges within me when I hear it. But I went indoors and returned with the OFF, spraying it liberally on my feet and legs. As I pushed up the pants leg of my jeans, I thought I spied a small red dot appear on my ankle. "You say our bodies are conductive and can receive electrons from the earth—that includes attracting chiggers, doesn't it? What about hookworms and roundworms?" My friend sighed again. "This chair is perfect for 'earthing,' and if you'll sit here thirty minutes, as prescribed for good health, I'll tell you a story about your new chairs. Did you know the Adirondack chair was originally cut from one plank and made from eleven pieces of wood?" "Uh, uh." I swatted at a giant bumblebee flying low and began misting my upper body with the OFF, twisting and turning in the chair as though a squadron of the bees had landed on me. "Keep your feet flat on the ground or you won't get the full benefit," my friend warned. I dug my toes into the dirt and grimaced. "To continue," Vickie said. "Here's the story I read about your Adirondack throne. This man named Thomas Lee had a summer place on Lake Champlain near Westport, New York and decided to build his own outdoor furniture for his family. He constructed what he thought was the ultimate lawn chair, and his family did a lot of chair sitting in the new chairs before his hunting friend, Harry Bunnell, came by one day and volunteered to build more chairs in his wood shop during the winter season. So Lee loaned Bunnell the plans for his chair, and Bunnell built some out of hemlock and basswood and stained them green and brown. When summer came, and residents of Westport saw the chairs, they loved them. Bunnell, realizing that he had a big seller and without Lee's permission, filed for a patent on the Adirondack chairs. They sold like hotcakes, and Bunnell called them the Westport Plank Chairs. 'Seems like the story ends there. No one knows if Lee continued being friends with Bunnell, and Bunnell put his signature on every chair he made. Today, these signed chairs, if discovered, are worth thousands of dollars." I jumped up and turned my chair on its side. A streak of black mold marred the rough surface of the chair bottom, and a few ants scurried away into the grass. "I think that chair came in pieces and had to be put together," Vickie said. "It isn't likely that anything is written on the bottom of it. I'm sorry I told you that story. You do have a serious problem relaxing!" I slipped on my sandals, picked up the can of OFF, and went indoors where I sat down at my computer and began searching for auctions scheduled in the Tennessee countryside. The following morning I looked out the kitchen window and saw a large robin using the wide arm of one of the Adirondack chairs for his morning constitutional—it was the chair I had vacated before my 'earthing' session ended. Then he flew to the ground and sat there using his bare claws to absorb electrons in just the manner my friend had recommended. I smiled, hoping that his grounding hours had added years to his life. When he soared off into a perfect blue summer sky, I went outdoors to clean up my ill-used Adirondack chair, sat down in it, and took off my shoes. Hardly a summer passes without our finding serendipity in North Carolina. This week it was umbrella weather when we left Sewanee, Tennessee, and heavy rain followed us on the drive to Asheville, North Carolina where we spent Monday night. Light rain fell the following morning when we set out for Montreat in the Blue Ridge Mountains, a town that straddles the eastern Continental Divide and is noted for being the home of Billy Graham, the renowned U.S. evangelist. 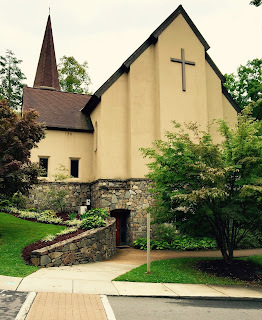 We took refuge in the Chapel of the Prodigal at Montreat College where we viewed the Return of the Prodigal Fresco by Benjamin Long who has gained international fame as a master of true Fresco. The Return of the Prodigal is one of eleven frescoes on "The Fresco Trail in North Carolina" and depicts the biblical story told in Luke 15. This fresco is the focal point of a chapel that was dedicated in 1998 with the words "Strength and Beauty are in His sanctuary" (Psalm 96:6). 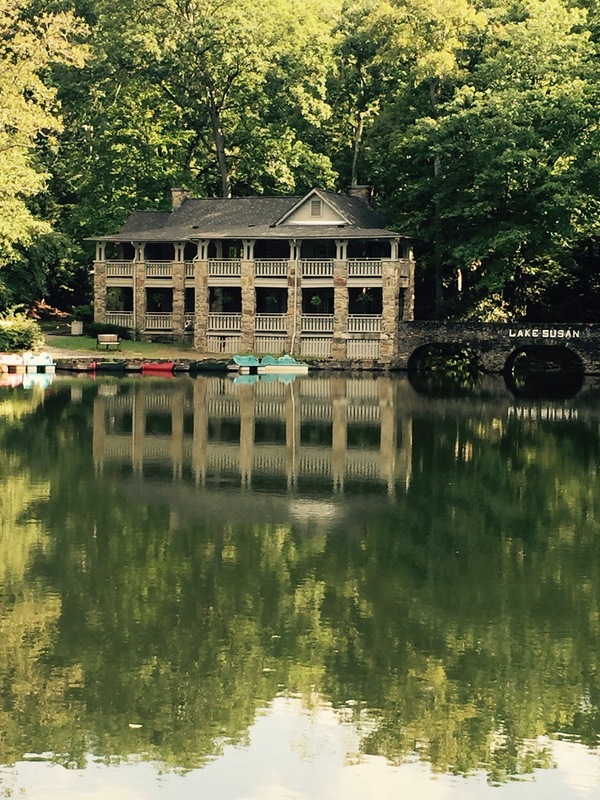 Montreat College was first established in 1916 as Montreat Normal School and is now a co-ed college with a four-year curriculum dedicated to being "Christ centered, student focused, and service driven," and is operated independent of the Montreat Conference Center. The town, college, and conference center (which serves the Presbyterian Church of the U.S.) are three separate entities, but all serve as centers for spiritual and physical renewal. 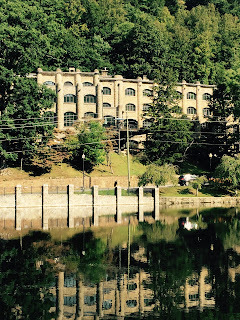 Montreat is another of those "thin" places similar to St. Mary's on the bluff at Sewanee. In 1897, Montreat Assembly was the first religious assembly established in the Swannanoa Valley by an interdenominational group, and in 1906, Montreat was purchased by a group of Presbyterians. accommodates guests from around the world who attend conferences on leadership, spiritual formation, multi-faith, seasons of the Christian year, recreation and radical hospitality, and is available for special retreats. Eight hallways in the Inn are named for trees and shrubs found in the Swannanoa Valley: Chestnut, Mountain Laurel, Rhododendron, Maple, Sourwood, Poplar, and Oak. Handsome Mission style furniture occupies the spacious rooms in this hospitable place where Billy Graham and Ruth Bell Graham held their wedding reception in 1943. The Assembly Inn gained national notice in 1942 when the U.S. government housed 264 German and Japanese diplomats and their families while they waited exchange for American families of diplomat and missionaries in Axis countries who were caught behind enemy lines when WWII broke out. The German and Japanese diplomats were restricted to the Assembly Inn and the property fronting Lake Susan and were looked after by State Department officials and guards. The Germans were eventually allowed to return to their families, and Japanese men were sent to an internment camp in Texas, but during the stay between October 29, 1942 and April 30, 1943, the Inn made a $75,000 profit! This week-end, leaders from the Presbyterian Church and public life will gather at Montreat to conduct a "Teach-In for Rededicating Ourselves to the Dream," celebrating the 50th anniversary of Dr. Martin L. King's address to the Christian Action Conference in Montreat. The major question posed to participants will be: "How can the church of today answer the challenges King posed in Anderson Auditorium at Montreat in 1965?" The intention of this conference is to engage an intergenerational community in embracing and lifting up Dr. King's unfulfilled dream... "standing up against what he persistently labeled as the horrible scourges of our national and world orders: racism, poverty, war, and materialism." And there's more! As we walked out of the Assembly Inn, we spied a shop overlooking Lake Susan, which we thought might be a bookstore. However, inside we found a plethora of handcrafted treasures that represented cultures of more than 30 countries including the Caribbean, Latin America, Africa, the Middle East, and Asia. The products of "Ten Thousand Villages" are showcased in this shop as part of a fair trade organization that markets handicrafts created by unemployed and underemployed artisans from throughout the world. 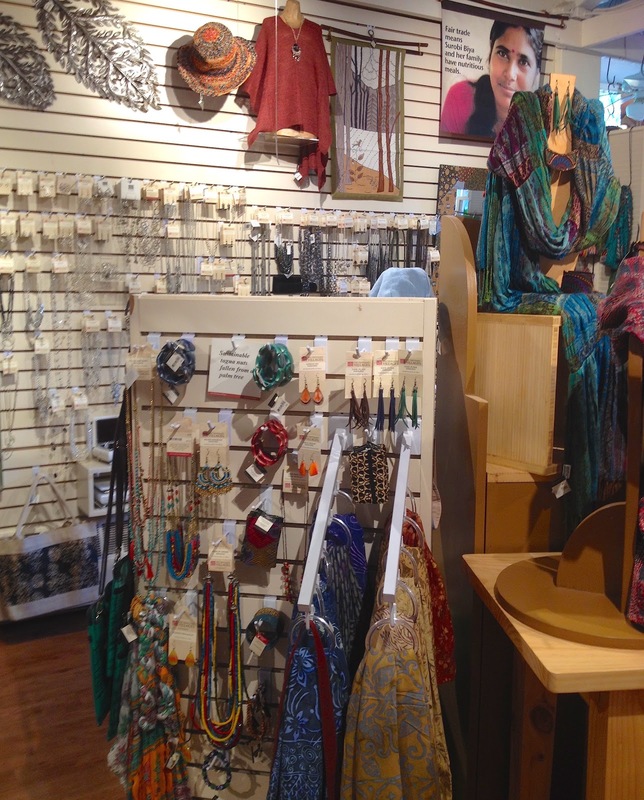 "Ten Thousand Villages" gives fair income to international artisans. The income empowers them to improve their housing and provides education, healthcare, and nutritious food for the artisans' families. "Ten Thousand Villages" has been operating since 1946 and is dedicated to solidarity and justice in the thirty countries with which it trades. I bought a beautiful scarf made by an artisan in Bangladesh, a bar of cucumber soap from India, and a children's book entitled In the Trunk of Grandma's Car, the story of a Mennonite woman named Edna Ruth Byler. Byler initiated the "Ten Thousand Villages" project when she traveled from the U.S. to Puerto Rico in 1946, brought back embroidery work done by women who struggled to feed their families, and sold it to her sewing circle in Pennsylvania. From that small beginning, the idea of a fair trade shop burgeoned and became 75 shops across the U.S. and 35 stores in Canada. Byler's first store was called Byler's Gift Shop, but in 1952, it became a nonprofit program of the Mennonite Central Committee called the Overseas Needlepoint and Crafts Project. In 1968, the name became SELFHELP Crafts, and the name changed again in 1996 to that of "Ten Thousand Villages." The trip to Montreat, a place variously called "A Mecca of Presbyterians," "the narthex of heaven," and "where God vacations," was, for us, a visit to a center of hope and an encounter with serendipity in one of the world's "thinnest places." Tiny houses seem to be the hottest residences in real estate today. However, they're not really the newest form of small shelters for those who want to avoid high rents or lifelong mortgages. When I see tiny houses advertised on the net, I inevitably think of Henry David Thoreau (Walden) and that 10 x 15 sq. ft. cottage he built in 1845 at Concord, Massachusetts for $28 and lived in for two years, observing nature in the woods near Walden Pond. Thoreau, like most people who gravitate toward the idea of the tiny house, had in mind two purposes for constructing his simple English-style cottage—to be self-reliant and to live simply. Strange how both of these literary luminaries were attracted to the idea of building tiny houses, and both of them didn't use them as long-time residences. However, Robert Francis, another poet who also lived in Massachusetts and joined the small house society, built the tiny house he had dreamed of owning for $1,000 near Amherst, Massachusetts so that he could have the solitude he needed to write and think. At "Fort Juniper," his small house surrounded by woods, fields, and streams, he subsisted on as little as $489 a year in 1952. He wrote in Travelling in Amherst: A Poets Journal 1931-1954: "Though I live far below The American Standard of Living, I am not impoverished or pitiful...I own my small home. I am well nourished [from his own garden], and adequately clothed. 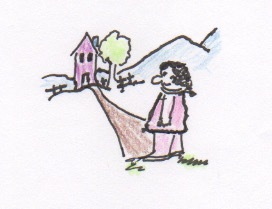 Few writers have more propitious conditions under which to write..."
From a poetic point of view, small houses sound idyllic. However, a 150 sq. ft. tiny house today might cost as much as $40,000; even a do-it-yourself project can cost $23,000. Many of these small dwellings are priced at $80,000. Most people who dream of owning these scaled-down residences seek acres of land on which to build and frequently have to build in remote places to obtain the plot of land they want to own. Also, poets may survive in those surroundings, but, more often, people who build tiny houses in remote places gradually begin to use them as vacation retreats. Still, there's the attraction of having wood walls and no sheetrock, the excitement of living in a place next to nature's heart, and the opportunity to get rid of all that stuff that has cluttered up your life for too many years. However, most of us who're attracted to the experiment of living in a tiny house might think twice about the isolation, poverty, and obscurity of which Robert Francis spoke and decide against this structure as a permanent domicile. After all, Thoreau lived in his small cottage only two years, and Mary Oliver ended up moving out of her la petite maison and making room for those tools with which she had built her tiny shelter. 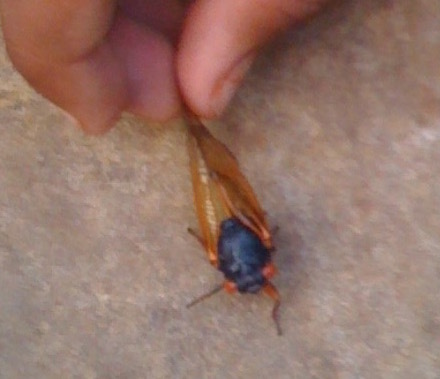 Summer is the time of the cicadas, and I've always loved the sound of their repetitious songs. However, as one who is afflicted with tinnitus (ringing or buzzing in the ears), I feel like an aging character in one of E. B. White's essays that appeared in the New Yorker: "A friend of ours...tells us that at this season it is almost impossible, walking or riding in the country, to distinguish between the poetry of earth and the racket inside his own head..." But when the cicadas emerge from their underground hideouts, I can distinguish a slight difference between the monotonous buzz in my ears and the symphonies that they composed in parts of Tennessee this summer. The male cicada does most of the singing, using tymbals (not to be confused with cymbals), membranes that vibrate when muscles are pulled, especially when the males are out romancing. Sometimes they create songs by flicking their wings, but the female cicada makes this motion more often than the male. I've read that these "courting calls" are highly effective, but infrequently they're just distress signals when the insect thinks it's going to become the meal of a predator. Many times, we hear entire symphonies created by cicadas—choruses composed and sung by male cicadas when they decide that if they get together and sing, a full symphony will attract females more readily than a solo. They synchronize with their tymbals, and the roaring sound is not unlike the strains of a Phillip Glass composition. Whatever the intent of these buzzing insects, I can detect this slight differentiation between their romantic rhapsodies and the tinnitus of old age humming in my ears. I always welcome a Cicada Chorus that signals the beginning of some summers, but this year I've been looking forward to the finale of dog days as we've had too many hours of heat, even here on The Mountain. When I see the curled yellow leaves of basil in my herb garden, I realize that the sultry season is nearing an end. I also know that the eggs of the singing cicadas that fell out of the trees have hatched and gone underground for a long winter nap—sometimes for 13 or 17 years. But my ears keep buzzing! Sunday afternoon, Vickie Sullivan and I returned to the Convent of St. Mary, where we worship regularly, to walk in St. Mary's Prayer Garden and to view the lavender fields that students, interns, and workers from Thistle Farms in Nashville, had planted and harvested several times. Behind the lavender fields, we walked a gravel path, lined with iris, to the labyrinth that Nathan Bourne, an intern at the Convent in 2012, had helped construct. 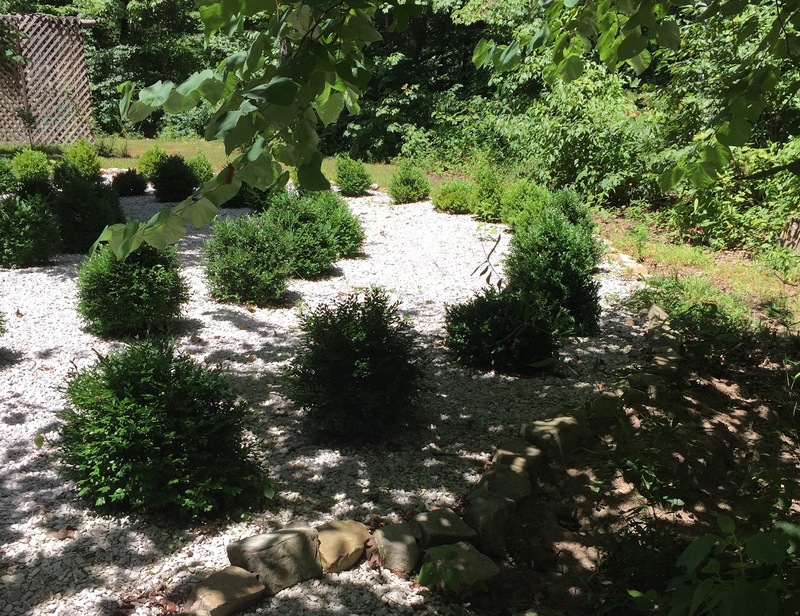 Native stone edges the path of the circles that were formed with boxwood plants, and a beech tree in the center of the labyrinth shelters it. 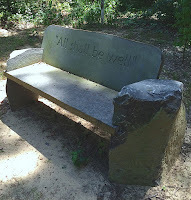 This space, only a few years old, carries the spirit of ancient Benedictine spirituality implicit in St. Mary's mission, and we savored the peace associated with prayer paths. After walking the labyrinth at St. Mary's, visitors can sit awhile on a stone bench inscribed with the comforting words of Julian of Norwich: "All Shall Be Well." It was a great place to spend time on a Sunday afternoon. The visit to this labyrinth reminded me of another labyrinth built in the backyard of Solomon House, the outreach mission in New Iberia, Louisiana for which I was once executive director. 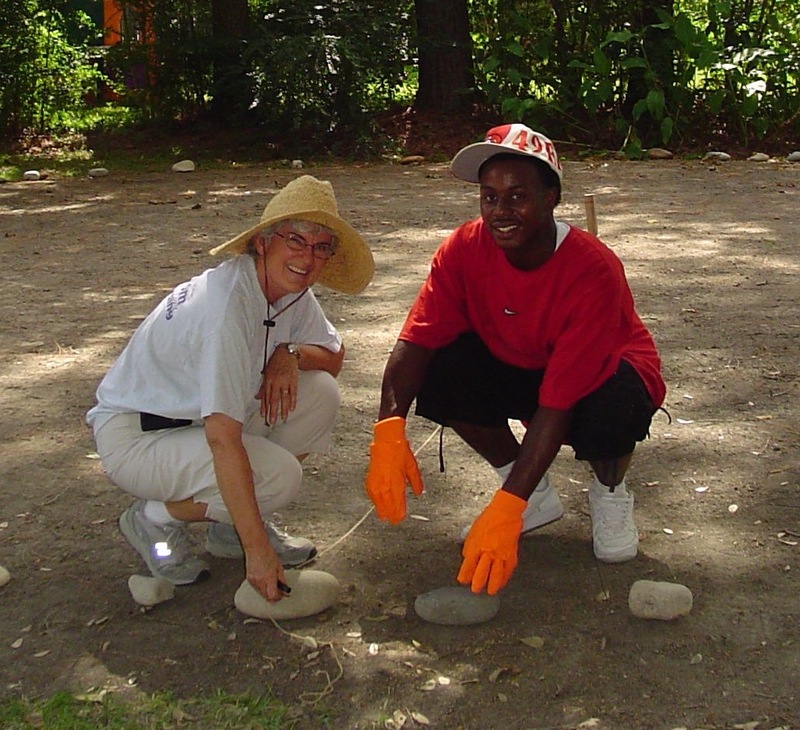 Vickie Sullivan, then treasurer of the Solomon House Board, and Betty Leblanc, former president of the Board, constructed this labyrinth initially as a temporary path for a Board retreat. On a hot summer day, the two women, armed with a stick, some string, and marking powder began work on the labyrinth. After clearing the yard, they anchored the stick in the center and used the string to mark off circles. One of the pair walked with the taut string while the other followed behind, pouring powder on the grass and marking seven rings, equidistant apart. They decorated the entrance with potted plants and prepared a place to set up a recording of music from Pachelbel. Board members who walked the prayer path the day of the retreat reported that their experience was so profound they wanted the labyrinth to become permanent so that the entire community of New Iberia could use it for prayer and contemplation. The design was actually an ancient one, using the bare earth as a base and river rock to delineate the pathways. 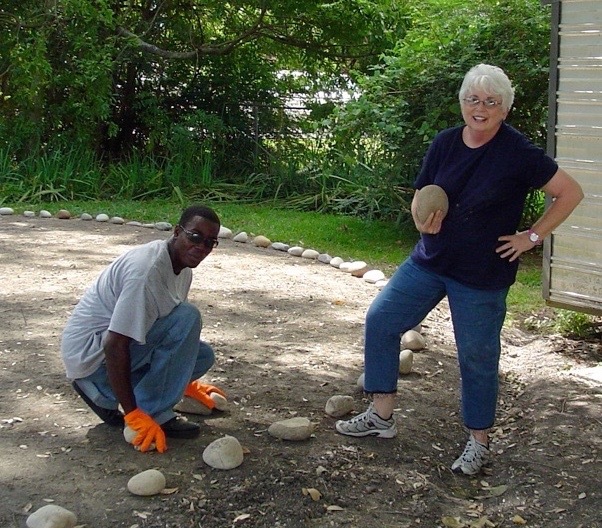 Betty's husband, Wilson, brought in extra dirt to fill in the lower spots, obtained a donation of 1500 pounds of cement to mix with the soil, spread the cement, and laser leveled the base. A small box containing information about walking a labyrinth was attached to a tree in the backyard. Coincidentally, the day the river rocks for constructing the labyrinth arrived, Hurricane Katrina blew in. Solomon House set up a food and clothing station to help with displaced people coming in from New Orleans. Many came to the outreach house to be consoled after they had lost everything but the clothing on their backs, including two young men who had been stranded on the overpass in New Orleans for days. 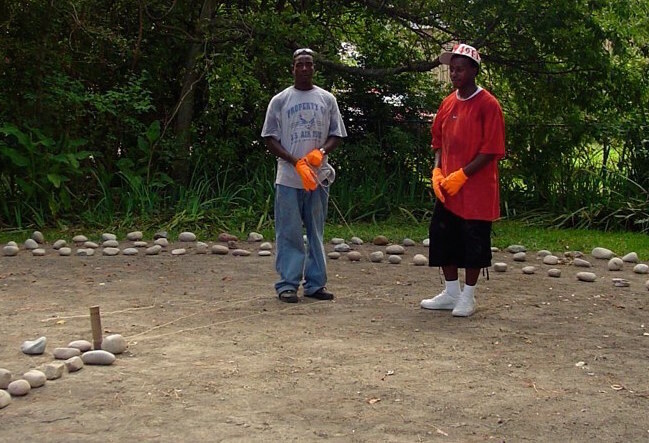 They helped move the rocks into place in the heat and humidity that usually follows a hurricane, and a sacred place was born. The labyrinth became permanent and continues to host Earth Day celebrations, board retreats, women's groups, and individual retreats. Labyrinths have been used for meditation and prayer since 3000 B.C. and can be found throughout the world. Chartres Cathedral in France contains one of the most famous pavement labyrinths dating back to medieval times when labyrinths were at their zenith.